NACE International’s Awards Program acknowledges leaders who have advanced the association through their dedication to the industry. Recognized around the world, these coveted awards celebrate the achievements of both individuals and organizations from the corrosion industry. Do you know a leader who deserves to be recognized? Review nominator eligibility and nominate a leader for one of the Association Awards acknowledging their dedication to the industry. Nominations for NACE International Awards are due June 30 each year. Questions? Email awards@nace.org for more information. This award is given in recognition of outstanding contributions at the Association level that resulted in promotion of the objectives of NACE, and is the signature award of the Association. This award is given for distinguished service to NACE by an elected or appointed member, or a group, for duties, responsibilities, or assignments, performed at the section, region, area, or association level. This award is given in recognition for technical achievement in corrosion engineering having significant impact on the practice of corrosion control, or on the enhancement of the profession of corrosion engineering. This award is presented for the most outstanding manuscript published in Materials Performance (MP) or CORROSION journal. This award is given for the most outstanding manuscript published in CORROSION in the calendar year preceding the award nomination deadline. The T.J. Hull Award is given in recognition of an outstanding contribution to NACE in the field of publications. This award is given in recognition of achievement in the field application of corrosion technology. This award is given for significant contributions to corrosion engineering, such as the development or improvement of a method, process, apparatus or equipment, or material that facilitates the control of corrosion or makes it less costly. The H.H. Uhlig Award is given in recognition of outstanding effectiveness in post-secondary corrosion education at the undergraduate or graduate level as exhibited by an educator who excites their students through outstanding and innovative teaching in corrosion. The Willis Rodney Whitney Award is given in recognition of significant contributions to corrosion science, such as the development or improvement of a theory that provides a fundamental understanding of corrosion phenomena and/or the prevention of corrosion. 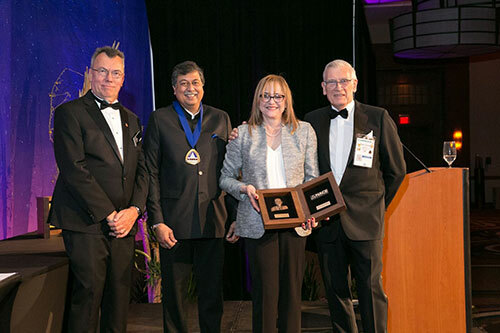 The NACE Distinguished Organization Award recognizes companies that have, over a sustained period of time, made outstanding contributions in the field of corrosion science or engineering, or for a major technological contribution to either field. The Founders Award was created in 2005 to recognize exceptional contributions and meritorious work by an individual on behalf of the NACE Foundation. The Outstanding Student Award was created in 2014 to recognize exceptional service to NACE International, NACE International Foundation, a NACE student chapter, or the ACC Student Sub-committee. Nominations received after this date will be considered the next year. All nominations received by the deadline will be considered by the appropriate Selection Subcommittee. Successful award nominations will be presented at the next Annual Conference. Unsuccessful nominations will be carried over to the next year with the exception of the Campbell, Distinguished Service, and Technical Achievement Awards. These awards are based on current annual activity. Nominations are to be sent directly to NACE Headquarters to the attention of the Awards Committee Staff Liaison who will forward copies to the appropriate Selection Subcommittee Chair. Nominations that are not submitted on the proper NACE forms with the appropriate information for the specific award will not be accepted.